Yesterday I got down a box of old toys when a friend with a baby visited. I thought the girls had grown out of them, but even years later they have enjoyed playing with them. Simple, open-ended play. Erica spent ages with four little pop up figures that she loved when she was younger too. Bright colours, easy for little hands to grab, and the popping motion is fun. Then, this morning, Imogen has spent some time with these beautiful coloured blocks. 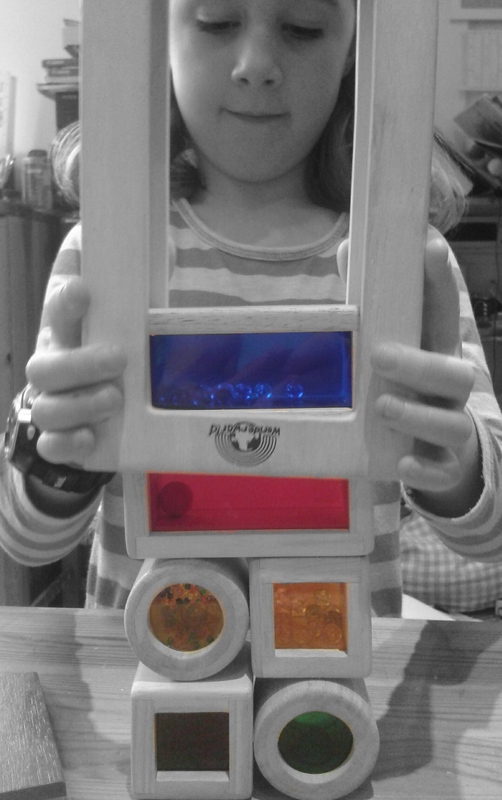 She wasn’t too interested in the colours or the sounds today, it was the shapes that attracted her – working out combinations of blocks that would remain standing when she tipped them out of the box. This entry was posted in Uncategorized by Slightly Crunchy Mummy. Bookmark the permalink.